One of the interesting things about language is that it's a bit of a seductive trap. The same could be said for art. You can build whole worlds in language or in art, and they can be so powerful that you can easily forget that they're not fully real. If you want your writing or your art to change the world, which has been a sort of touchstone in various periods of history, including our own, the thing to realise is that art and words do create a world, but more like a blueprint for people to follow. They create an entire world for people to inhabit in their imagination, which then gradually unfolds and becomes reality in some way. Traditional critical and political art often has this backwards, thinking that art and words can intervene directly in current events. That sort of thing is nearly always embarrassing, especially when viewed in hindsight, like soviet realism. Art and words work slowly, they build up a world over time, they do the 'vision' thing, but in a much more powerful way than mindless management fads. 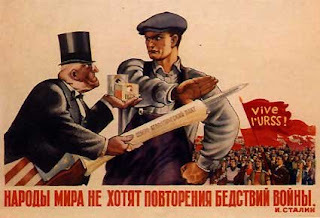 Sure propaganda can be beautifully done, but that doesn't so much create a world as reinforce one you have already. Another side to this is debate. The culture wars created a toxic environment of zealotry from all sides, mostly inspired by the mistaken notion that ideas have a direct influence on events. If you're going to use words to change things, make them words that seduce people, over time, to think differently. At the end of the day governments fell no matter how much moronic sludge the zealots spewed forth, as the vast majority of voting people don't give a fig about ideas - any ideas. Not that words have no effect, but again it's not a direct effect, it's a gradual seduction. Persuasion is a slow-moving glacier in history. It's not clear who first said if you have 'em by the balls, their hearts and minds will follow. (Likely a man.) There's truth in that in the short-term, but in the longer term persuasion is the tectonic plate that makes all of the really big changes in how we live. Those who bring about real change in lives are almost always ahead of their time. In their own time they are variously unrecognised, despised, ridiculed or most often ignored. This is because the world-to-come they're drawing is not the world they live in, so there's obviously not many immediate points of resonance. You can see this even at the popular culture level, bands who speak loudest of the issues of the day often have righteous indignation on their side, but rarely do they fundamentally change or excite people. The Beatles in part took the world by storm because they weren't, at least at first, raging against the machine but instead providing a glimpse to a world that hadn't yet arrived. I've seen the same thing with Queen in my own lifetime, critically despised throughout their career, and yet there's hardly a band or solo artist playing today who doesn't cite them as something that shook their world. At the time critics and even other musicians didn't 'get' them, but millions of people did get them, and they're now the mainstream.